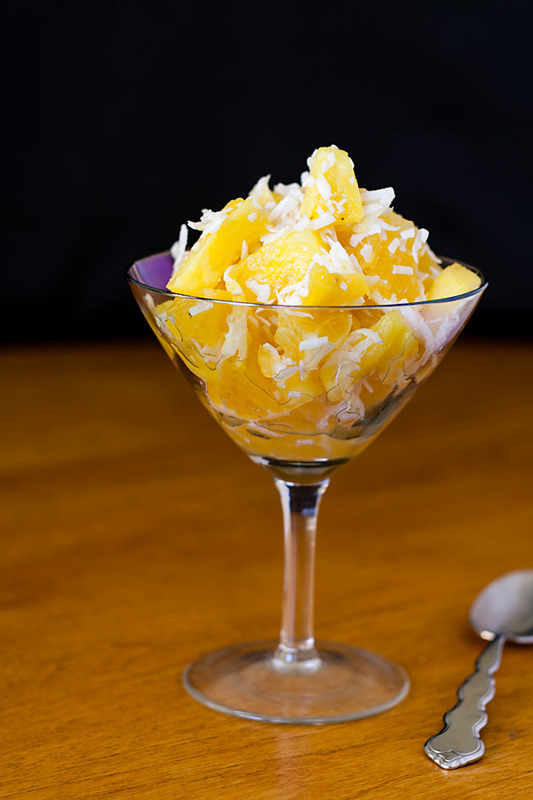 There are only three ingredients in this simple vegan ambrosia salad. 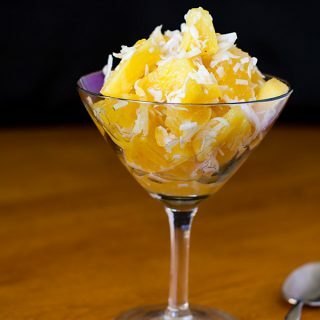 You will not miss the dairy, fat, or calories in this classic version of ambrosia. I’ve been feeling kind of guilty about not telling you what happened with the Thai eggplants and citrus fruit that I wrote about after Thanksgiving. I’m afraid I made up a new, very successful recipe for the eggplants but didn’t write it down or photograph the dish. You see, it was late and we were starving by the time the meal was ready, and I really didn’t expect it to turn out as well as it did. If I remember correctly, I pan-fried tofu, sautéed the quartered eggplants, and mixed them with a peanut sauce. We really loved the texture and taste of the eggplants–much crisper than the regular kind. If I can find Thai eggplants, I promise I’ll make it again and share the recipe. As for the citrus, I’m a minimalist when it comes to fruit, so mostly I’ve just been eating it. I do plan to make a pie, so watch for that in the next couple of weeks. But until then, here’s a simple recipe that is a holiday tradition for many people in the South, but probably even more so in my family because we always have oranges ripening at this time of year. “Ambrosia” in Greek mythology means “food of the Gods. 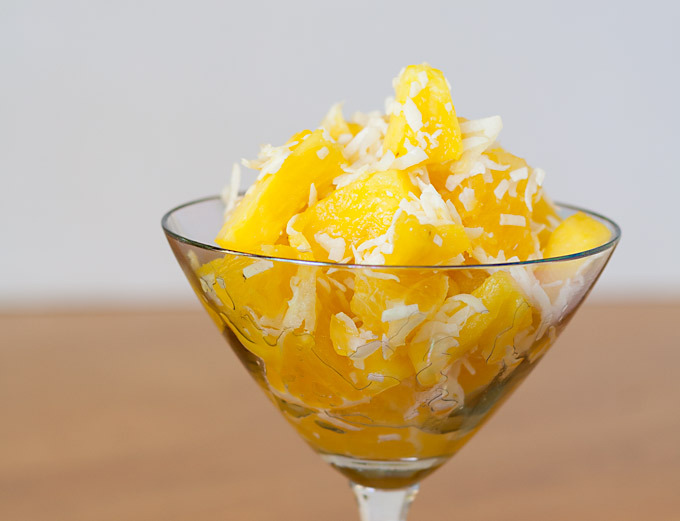 Where I come from, it refers to a fruit salad containing oranges pineapple, and coconut, a combination that definitely tastes like the food of the gods! Other ambrosia recipes may contain cream, sour cream, or marshmallows (or all three! ), but the version my father makes has always been simple and dairy-free. So vegan ambrosia does not seem unusual to me, but if you’re expecting the heavy, dairy version, you’ll be surprised at how light and tasty this recipe is. My father, aka “The Perfectionist,” always removes all the membranes from the oranges (also known as “segmenting”) when he makes this; in other words, he cuts out each section from the membrane that divides it from the others. I’m much lazier than that, so I just chop the oranges, membranes and all, and it still tastes great. You'll be amazed at how delicious three simple ingredients can be! Use the freshest oranges possible. Mix all ingredients well. Refrigerate and let the flavors mingle for at least a day. Serves about 4. Truly nectar of the gods! I haven’t forgotten my promise to post the sweet potato casserole recipe, so expect it soon. I was invited to tea/baby shower by a friend from England. I had to bring something that goes with cucumber sandwiches…I made this just to get by but boy oh boy what flavor! My kids said that the kitchen smells heavenly. I love ambrosia, too, and just put the last of my Thanksgiving leftovers (frozen) in my morning smoothie! Mine is just plain oranges and coconut, or a mixture of citruses — navel oranges, clementines, even a few cross-section-sliced kumquats, and white and pink grapefruit with the coconut. It’s my favorite Christmas treat, too! The day before Thanksgiving, and suddenly I want an ambrosia salad without all the fake stuff. Thanks for coming through for me once again. I can’t tell you how much you’ve enhanced our plant based eating! I think I’m going to try this with lemon juice soaked bananas as well. I make a similar ambrosia. I add a sliced banana, some craisins, and a little orange juice. A couple of tsp of brandy is also good.